Toll Rises From Deadly Car Bomb In Nigerian Capital : The Two-Way At least 19 people died in the blast Thursday in Abuja, according to officials. Separately, the government says more girls were taken in a mass kidnapping earlier this month than previously believed. A destroyed car is seen at the blast site in Nigeria's capital, Abuja, on Thursday. The death toll rose to 19 on Friday. 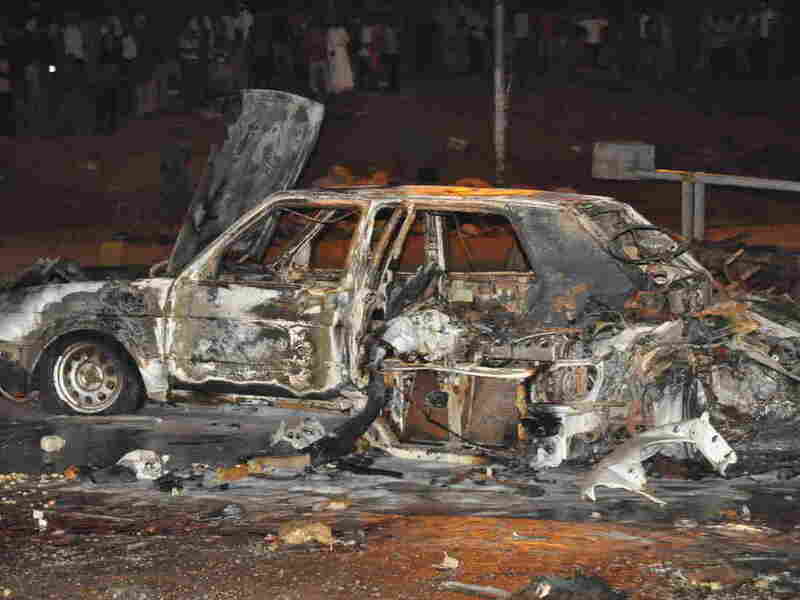 The death toll from a car bomb in Nigeria's capital — the second in a month — has risen to 19, officials said Friday. The attack occurred days before the city is set to host a major international conference. The explosion Thursday on a busy street in Abuja occurred near a bus station where 70 people were killed in an April 14 bombing, Reuters says. The Islamic extremist terrorist network Boko Haram claimed responsibility for last month's attack. Police Superintendent Frank Mba told reporters that the toll from Thursday's blast had reached 19 dead and more than 60 wounded. Abuja is hosting the World Economic Forum on Africa May 7-9. The conference is to feature Chinese Premier Li Keqiang. It attracts leaders, policymakers, philanthropists and business leaders from around the world to discuss Africa's economic growth prospects. In other news, police in the country said the number of schoolgirls held by Boko Haram militants after a mass kidnapping last month was 276 — 30 more girls than in earlier reports. Police Commissioner Tanko Lawan also revised the number of girls and young women who have escaped to 53. According to The Associated Press, Lawan said that confusion over the number of girls abducted stems from the fact that "students from other schools were brought into one school for final exams last month after all schools in Borno state were shut because of attacks by Islamic extremists. Communications are difficult with the military often cutting cellphone service under a state of emergency and travel made dangerous on roads where travelers are frequently attacked by the militants." The mass kidnapping in Chibok in northeastern Borno state was among the most shocking attacks by Boko Haram in five years of separatist conflict, which has left thousands dead in the country's north and central regions. NPR's Ofeibea Quist-Arcton, reporting from Dakar, Senegal, says there's still no word on the fate of the girls. There are a number of theories, including forced marriages and/or being moved across the border to either Chad or Cameroon, Ofeibea says. Weeks after the April 14 kidnapping, "the people want answers," she says. The parents have a sense of hopelessness and despair. They've held protests in Abuja and the city of Chibok this week. A previous version of this post included quoted material that was incorrectly attributed to NPR's Ofeibea Quist-Arcton.